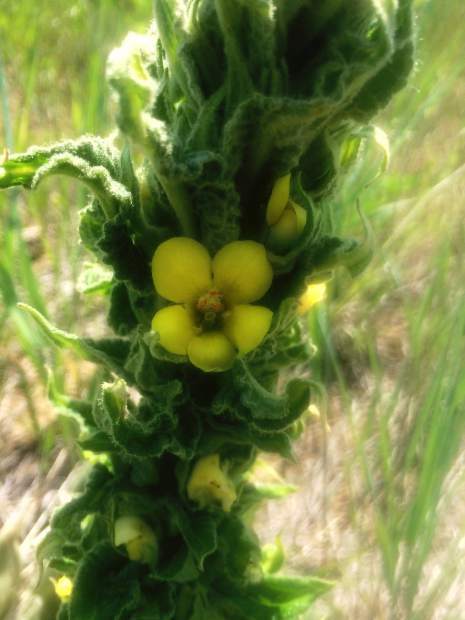 Common mullein is a biennial — two-year plant — on the C list for noxious weeds. The leaves are very fuzzy with tiny hairs. These plants send up a single flowering stalk. The yellow flowers have five petals. A plant may produce 100,000 to 180,000 seeds. Seed viability is 35 years to more than 100 years. Common mullein was introduced in the mid-1700’s in Virginia as a fish poison. By 1876 it had reached the west coast. There are several medicinal properties to the plant. However, it out competes are native plants, is not readily grazed and is a sign of a degraded ecosystem. Go to http://www.weldweeds.org for more information on controlling this plant.